English courses with Twin: Being a student in London! Being a student in London! 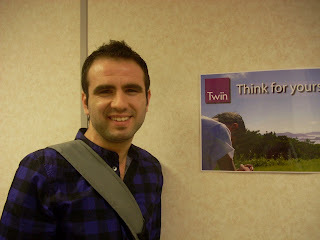 I’ve been attending the Career Development Programme at Twin English School in London for a while now. And I just can say that I love living in London. It’s the first time for me to attend an English course in London and I am really enjoying it. I’ve already learned a lot and I can tell that my English gets better, day-by-day. If you are a student of an English School in London it will be impossiblefor you to get bored. There is so much to see and to do in London; you can go to the museums, walk through the parks or do some shopping on the Oxford Street. Twin English School in London also provides an exciting social programme, which can be joined by every student. What I like best about my life as a student in London is the nightlife. Being a student of an English School in London gives you the opportunity to enter selected nightclubs for free. On weekends you can go out, have fun and enjoy yourself with your new friends from the English School in London. At the end I just can say that If you are a student of an English School in London you should enjoy your time in this metropolitan city, if you come here you will feel very lucky.